Street Swell: Can't We All Just Get a Longboard? So I am packing for the Buffalo Bill Downhill and it occurred to me I need to take boards. 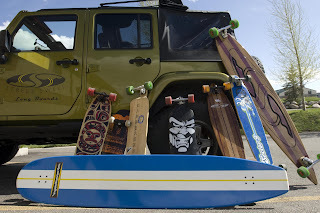 Well being a longboard company the first thought is how many Street Swell Boards can I cram into the Jeep. But then I start thinking “man the Landyachtz board would be fun on that hill” not that I ride like these guys. Then in a moment of St. Pauli Girl induced sentimentalism I realized how many cool board manufactures there are. I can’t think of any I am willing to give up. Hamboard, Landyachtz, Arbor and the board that started it for me, Sector Nine. And then there are the boards that I will buy in the future. Boards from Miramar, Honey , Never Summer and a lot of others. I guess the point to this rambling is longboarding is so cool and is here to stay. There are an endless list of great people in this sport, Ryan from Landyachtz, Rob from Skunktech crazy Bobby from Concrete wave, nick from Miramar,Kia from Silvervish the list goes on. The act of riding itself is very freeing and in a since cleansing. I look forward to a continued love affair with longboarding and building friendships with the characters it brings into my life.